John McGuinness, pictured here with brolly girl Bruce Anstey, is the undisputed King of the Mountain, having won 19 times on the Isle of Man TT Mountain Course. Even at 40-years-old and a bit thicker around the middle than his fellow racers, one would have a hard time arguing that McGuinness is not at the top of his game, as the man from Morecambe is well on his way to beating Joey Dunlop’s all-time TT race win record. 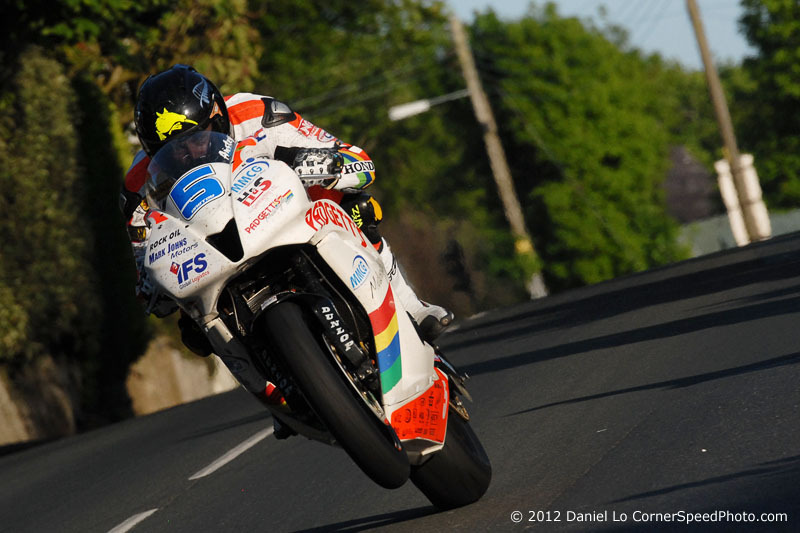 So how has McPint become the winningest living TT racer in history? With a massive amount of course knowledge, that’s how. Coupled to strong bike entries, and a team comprised of road racing’s top talent, it makes perfect sense why McGuinness is the favorite to win whenever a 1,000cc machine is involved, and you can’t count him out of the 600cc Supersport races either. 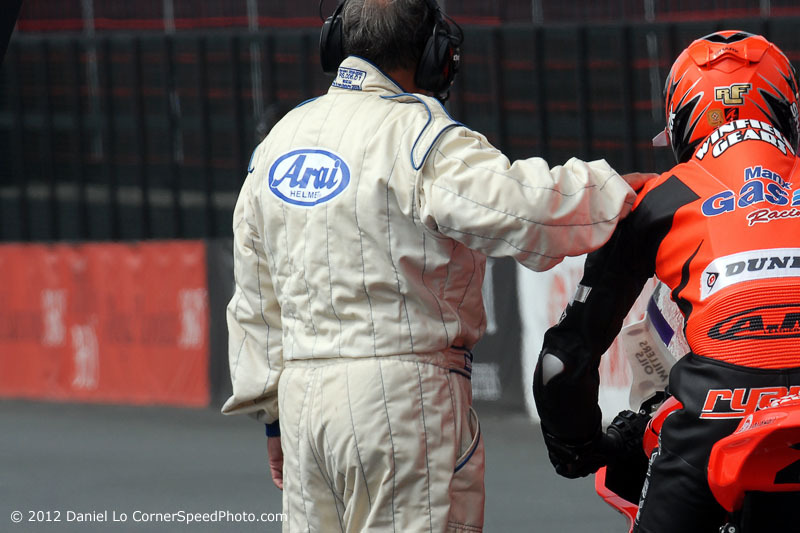 Narrowly missing his chance to break the 20 race win barrier on an electric bike, McGuinness was also instrumental in the cancellation of the Senior TT at the 2012 Isle of Man TT, a race he likely would have won. McGuinness and his team will be back next year though, as will his competitors who are eager to knock the King off his thrown. We imagine a few of them will be paying close attention to the course notes given in the video after the jump. John McGuinees, the King of the Mountain, could quit road racing today and go down in history as a legend of the sport. The thing is though, Mr. McPint is showing no signs of slowing down, and in reality McGuinness is at the top of his game — adding two more race wins from the 2012 Isle of Man TT to his impressive total. Nineteen wins to his name, McGuinness was favored to win his 20th in the Senior TT, after coming in second during the TT Zero competition. There doesn’t seem to be any doubt in the TT paddock that McGuinness will break the twenty-win barrier, a feat only ever accomplish by one other man: Joey Dunlop. But, fate has a cruel way of changing our expectations. Three wins in a TT fortnight is no easy matter, and no one wants to win more than John McGuinness himself. So, it goes to show you a bit about the man when you learn that McGuinness was instrumental in the canceling of the Senior TT, since his voice hold some of the most weight with the riders and Race Control — even though his own racing interests would have been served best by the race’s continuation in adverse conditions. On that Saturday’s Senior TT, no one wanted to make more history than McGuinness — of course he wanted to do so in an entirely different way than what occurred. It will now be a long wait before he can lay claim to that twentieth IOMTT victory trophy, but John McGuinness isn’t too worried about that I suspect, and I reckon he has his eyes leveled firmly on the horizon, staring at what would seem to be an impossible an impossible number that starts with three. The stage was set for Guy Martin to take his first ever TT win in 2012, with the popular fan favorite returning with the same team with which he scored four podium finishes in the previous year’s contest. Top-level crew, competitive machinery, and one of the fastest men to ever lap the Mountain Course teaming up again for another assault. Reaching the top step of the podium should be all but a forgone conclusion — or at least in theory. What resulted instead was truly a week to forget, starting with Guy getting nudged off the podium in the opening Superbike race when his crew was unable to change his rear tire for the final two laps. The first Supersport race ended prematurely after his engine gave out, forcing a retirement into the pits, after just a single lap. The Superstock race that followed was barely an improvement, with Guy taking an anonymous eighth place finish, after being off the pace from the start. Further engine problems in the second Supersport race again saw him off the podium, finishing down in fifth. To cap it off, a final shot at a good result was thwarted by the first ever cancellation of the Senior TT race. Things did not go according to plan, to say the least. Ian Hutchinson may not be a household name here in the United States, but over on the Isle of Man, “Hutchy” is a pretty big deal. Winning five solo-class races in the 2010 season, the English rider’s hot-streak was cut short after a tragic closed circuit racing accident, which saw him sidelined for the 2011 TT fortnight. Suffering another leg injury going into the 2012 racing season, Hutchinson was still physically not 100% as he headed to the TT, with the Swan Racing Team making obvious adjustments to his Yamaha YZF-R1 to accommodate Hutchy’s injured leg. While Hutchinson would ride through the pain, he was noticeably off the pace during this last TT meeting. While a large component of those results are surely products of his physical state, where were compound by the fact that his practice and racing schedule has been truncated, many also wondered about Hutchinson’s mental state as well. Twice beaten, once shy, one Swan team member explained to me that when you looked into the his eyes as he got on board the bike, there was something there that didn’t exist before in Hutchy’s eyes. “Fear?” I asked. The team member wouldn’t comment further. Suffering the same postponement and delays as the PokerStars Senior TT, the 2012 BikerPetition.co.uk Lightweight TT overcame the adverse conditions, finally getting its start well into the Saturday afternoon. With the 650cc twin-cylinder class getting reinstated for the 2012 Isle of Man TT, there was tremendous pressure for the race to go ahead this fortnight, especially with the number of entries that solely arrived to compete in the class. Reduced from four laps to three, the strategy for the Lightweight TT got amplified, with riders having to choose when to take their pit stop: ahead of Lap 2 or Lap 3. The 2012 PokerStars Senior TT is making history books, despite the fact the race was postponed from Friday to Saturday, and ultimately cancelled late in the afternoon on its rescheduled race day. The first time the Senior TT has been called for track conditions, the only other time the blue ribbon race has failed to run has been during the TT’s racing suspension for WWI and WWII. Leaving fans to wait along the Mountain Course for several hours, the race was finally scrapped after a contingency of TT riders viewed the full course via automobile. Finding damp patches along sections like the Mountain Mile, John McGuinness et al deemed the race too risky for the 200+ bhp superbikes, though they thought that the tamer inaugural Lightweight class (650cc twins) would be alright to make the run. The bike that carried John McGuinness to his 18th career Isle of Man TT win, the very same Honda TT Legends CBR1000RR could be the King of the Mountain’s stead to an even 20 wins this TT fortnight. Making 200+ bhp, the factory-backed Honda CBR1000RR has to contend with some of the most gruel miles in racing, and has the scars to prove it. Pitted and potted with rocks and pebbles from the course, McGuinness’s ride on the CBR is an equally tumultuous affair. Splitting his time equally between head shakes and wheelies, it is no small feat in keeping a TT bike on-line at the famous road course. Only able to complete two laps before needing to be refueled, the Honda TT Legends race team has not only optimized the Honda CBR1000RR for the 37.733 mile Snaefell Mountain Course, but also for the single and double pitstops it will have in the Senior TT and Junior TT races, respectively. Looking at the bikes of the other teams, what is most striking about McGuinness’s ride, aside from its drool-worthy livery homage to the Honda RC30, is how stock the bike appears. Sure, there is a heavily massaged and tuned motor underneath that bodywork, and the bike’s top-shelf brakes, wheels, and quick-shifter are readily apparent, but for a bike that any racer would kill to ride, the Honda TT Legends CBR is rather unassuming, as is its portly rider. Maybe that is how they like it.